Have Your Puppies Had Health Screening? Advice Please. I have had a succession of blue merle girls, with a long gap (apartment living) the last 15. 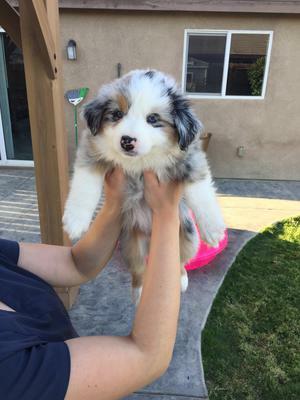 I recently put a deposit on a puppy. The father is AKC and the mother is not. I am scheduled to pick her up May 16th. I called the vet to discuss puppy care and appointments and was advised not to get any Aussie that has not had genetic parental testing for MDR1 and cataracts, an exam by a canine ophthalmologist, and X-rays for hip dysplasia. I'm pretty sure this litter's owners have done none of that (outside of the father having the necessary AKC tests). The price is less than half of what you usually see. I feel like such a dummy. My other dogs were AKC, and I just thought to myself, I don't care about AKC registration. I'm not going to breed her. Comments for Have Your Puppies Had Health Screening? Advice Please. Ask your breeder for a geaneology on the mother of the litter - her parents, grandparents, etc. You might even follow those dogs back to their origins if you are really concerned. That will give you some clue as to the quality of health you can expect. Also, if you can check online for the various tests you might be able to find exactly what the risks and frequency of developing those problems are. If you are still really concerned, bail. You might get your deposit back, but even if not, that money would not be worth a life of heartache and expense with your dog. I may be incorrect, but to the best of my knowledge and experience the AKC doesn't actually require any testing at all; they are a registration organization and only care about the lineage. I believe that the ASCA may require certain tests, but if not registered with the ASCA then it is possible that no testing has been performed on the sire of the litter either. The testing mentioned by your vet is certainly worth having done with the number of heritable disorders in the breed now. I had a trainer who did competitive agility with her aussies and always purchased from good lines, but both still had hip issues and one developed epilepsy at a young age. Worth it to check now. I know that any dog can get sick, but I have decided to go with another breeder, one whose parents are clear and puppies tested. I was so concerned about who would get the puppy (and take good care and be kind to her, you know?). I texted the breeder the next day. She said their vet tech was going to take her, so I'm hoping she is in good hands. Tough on me though. I was already attached, even with only one meeting at 3 weeks of age. Thanks again for your input. I think requiring all those tests on a puppy is overkill. I've had Aussies for 30 years and have never bought one with those tests already done. I always purchase my pups from reputable breeders who take extreme pride in their lines. The only tests they do is an eye exam and of course, the health certicate showing shots, etc. MDR1 is a condition in certain breeds but definitely not a deal breaker. Almost all collies are positive for this mutation. The reason to get tested is to be aware of the problems with certain drugs. X-rays of hips shouldn't even be done until the pups are 2 yrs old to get an accurate result. Researching your breeders is the best way to make sure your getting a healthy pup. Good luck!! Glad that you decided to pursue other options. Not that the puppy would have developed any issues, but it would have been heartbreaking if it did develop something that could easily have been screened for, not to mention very expensive if it was something like hip dysplasia, epilepsy, or one of the eye conditions requiring surgery. Without proof of testing or, at the very least, a comprehensive and searchable genealogy on both sides (like with ASCA/AKC and DNA or CHIC numbers) buying any purebred dog is really a gamble at best.